I love anything as a rice bowl. 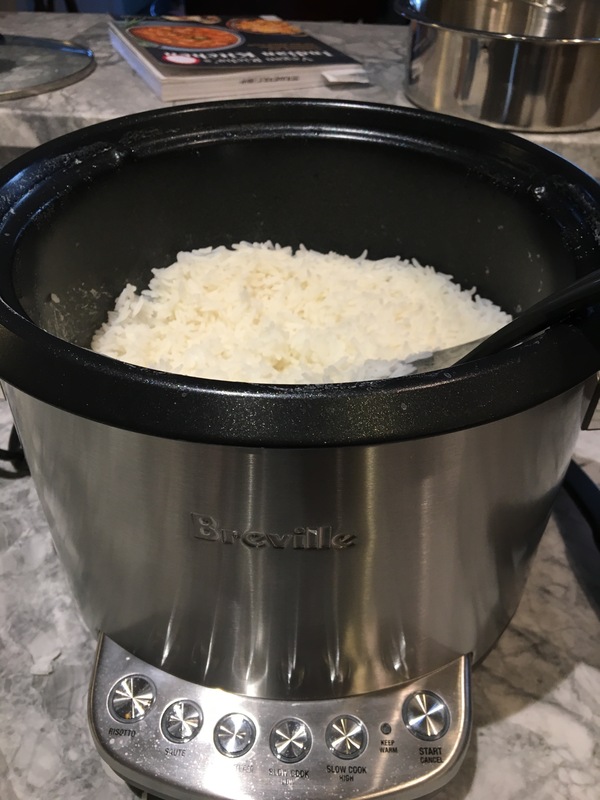 So I recently invested in a Breville rice cooker. It’s not something I ever thought I needed, but we prepare grains like quinoa, rice or farro so I often I felt it was worth a try. Well this baby steams grains to a perfectly soft, stickily tender consistency. My mind has been opened to vegetarian rice bowl possibilities! It really makes my meal preparation so much easier and this appliance has become a staple on my countertop now. Today I was in the mood for a Hungarian inspired Tofurkey Polish sausage with cabbage and peppers heaped on top of a steaming bed of rice. 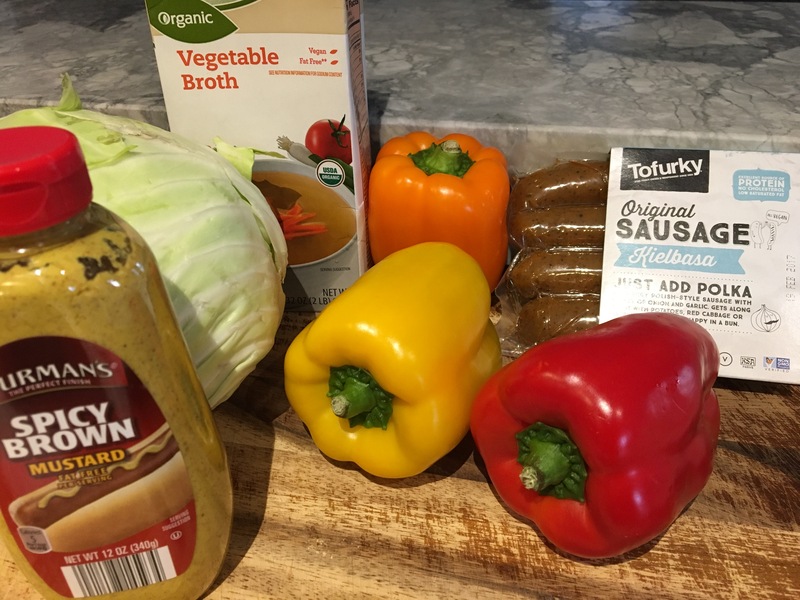 The cabbage chunks marinate nicely in a simmering pot of paprika and garlic infused vegetable broth giving it a nice a silky texture, while the peppers and sliced sausages fry up on a medium high setting for a slightly charred, roasted taste in a separate pan. Add a dollop of brown mustard and sauerkraut on top of this dish and you will not be disappointed in this rice bowl version of a polish dog. 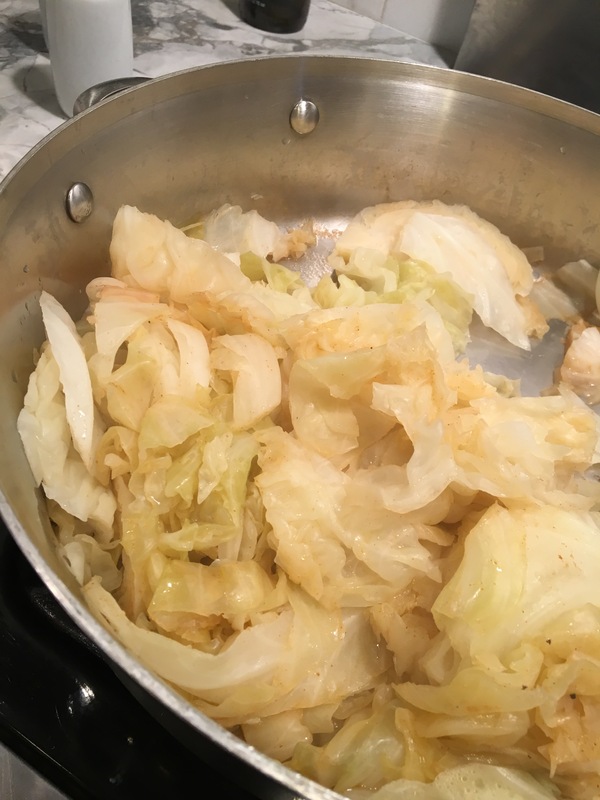 Add chunks of cabbage to a large sauté pan along with 1 cup vegetable broth and spices. Cover and let simmer for 30 minutes, turning every 5 minutes. 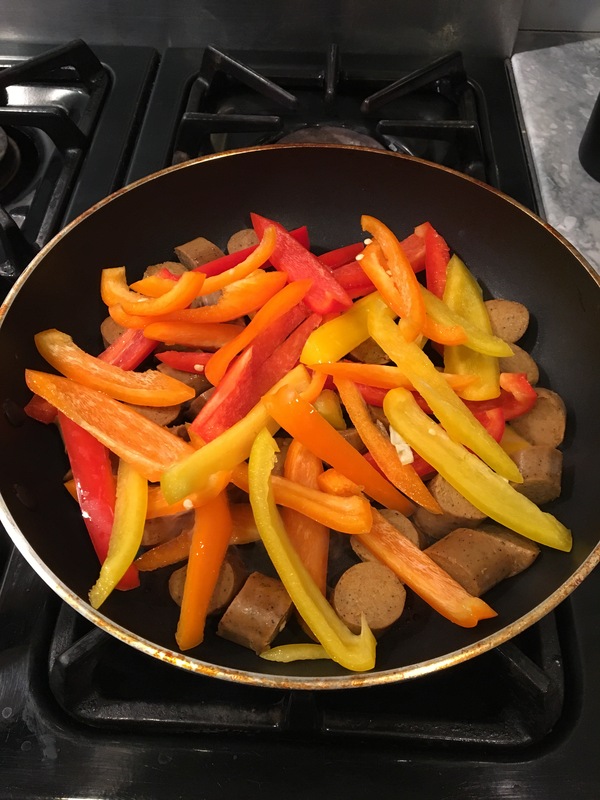 I large frying pan add olive oil, peppers and sausages. Cook on medium heat for 10 minutes turning frequently. Once oil seems to dry out, let the peppers char very slightly in pan. Cook your choice of rice separately, then scoop cabbage and pepper/sausage mixture on top in a serving bowl. Top with spicy brown mustard or stone ground mustard and a small scoop sauerkraut.